After several internet searches and more phone calls I found a location in Albuquerque that takes both carpet and carpet pad for recycling. Per instructions, I cut the carpet into 6 foot widths, rolled up the carpet and pad, then loaded it all into the car for the drive to Albuquerque. Drop off was quick, painless and anti-climactic, so I asked a few dumb questions and took a few "recycling tourist" photos. Apparently all "foam" carpet pad is recycleable as is Nylon 6 carpet. Appropriately, the old pad is remanufactured into new pad and old carpet becomes new carpet. I didn't wait to find out if our carpet was Nylon 6, but chances are about 90% that it was. So what did I learn? 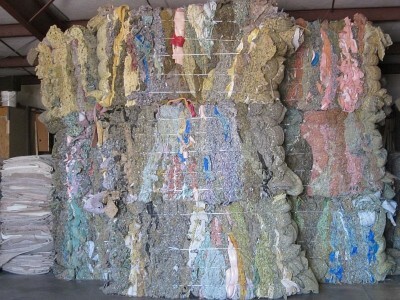 You can recycle carpet and pad, it doesn't have to go into the landfill! But, it took a 120 mile round trip drive to recycle that carpet and pad. Also, you really don't want to know how much dust is in your carpet and pad.